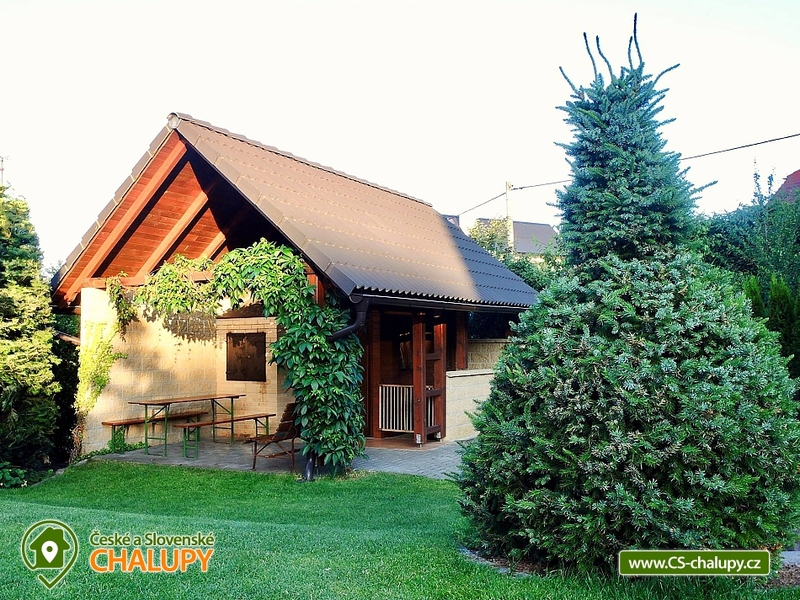 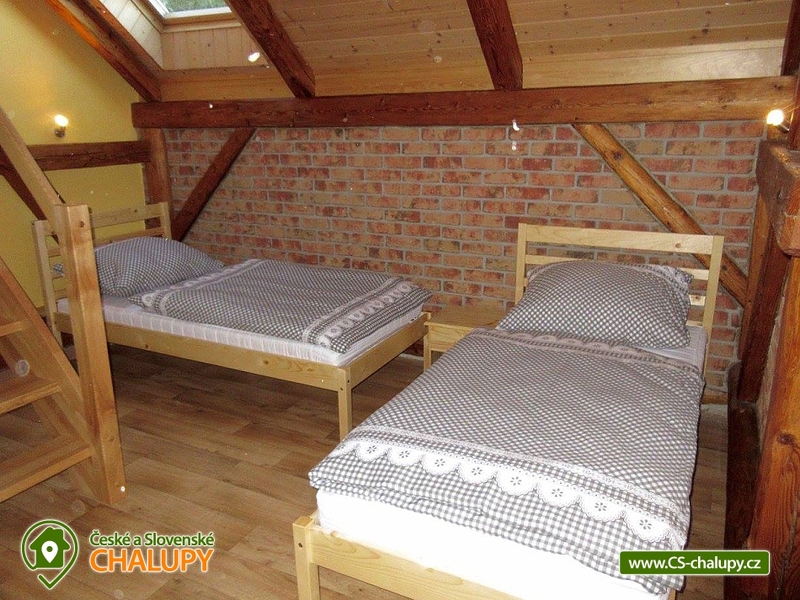 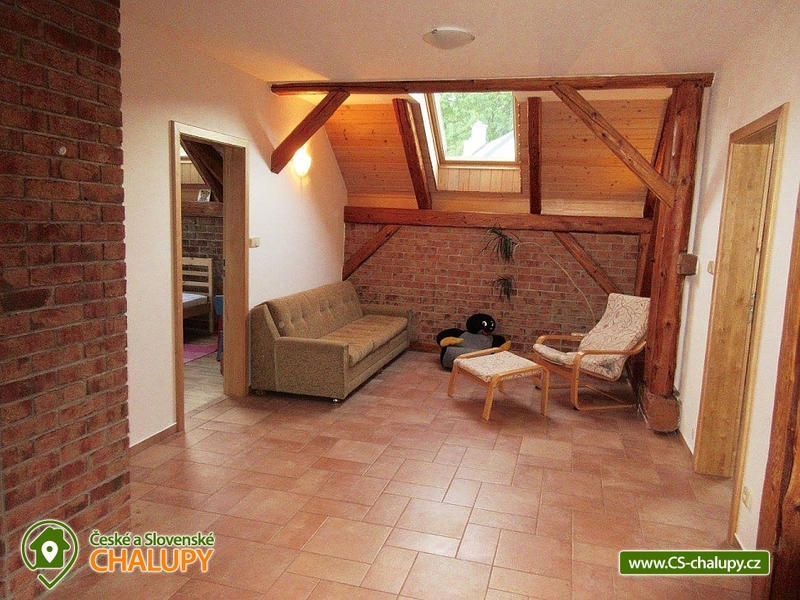 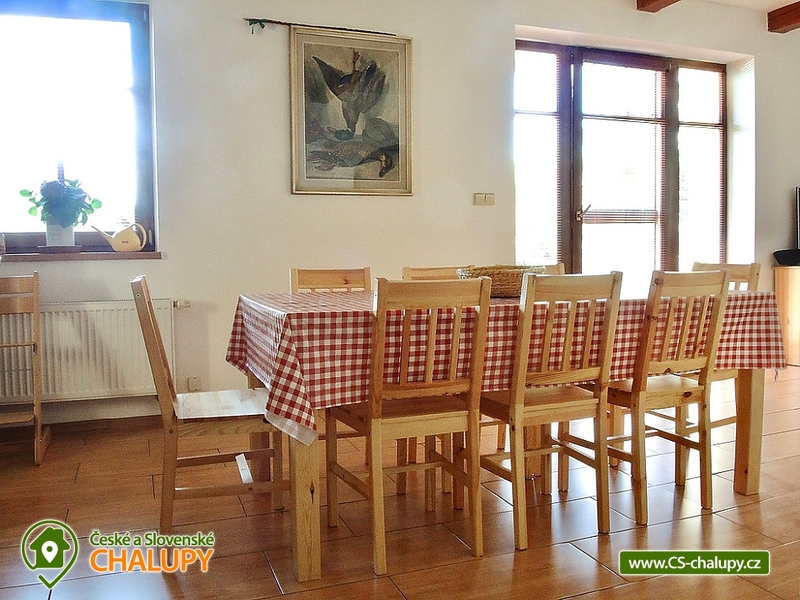 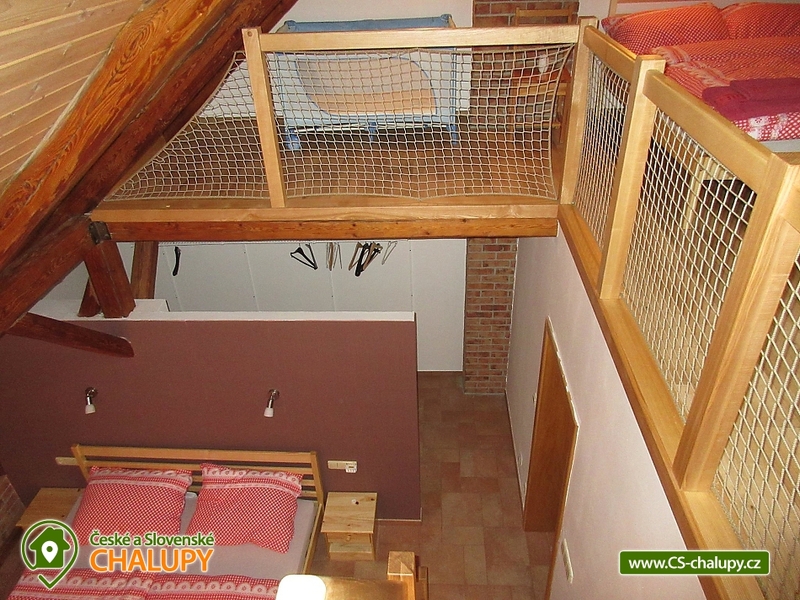 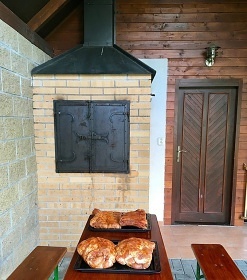 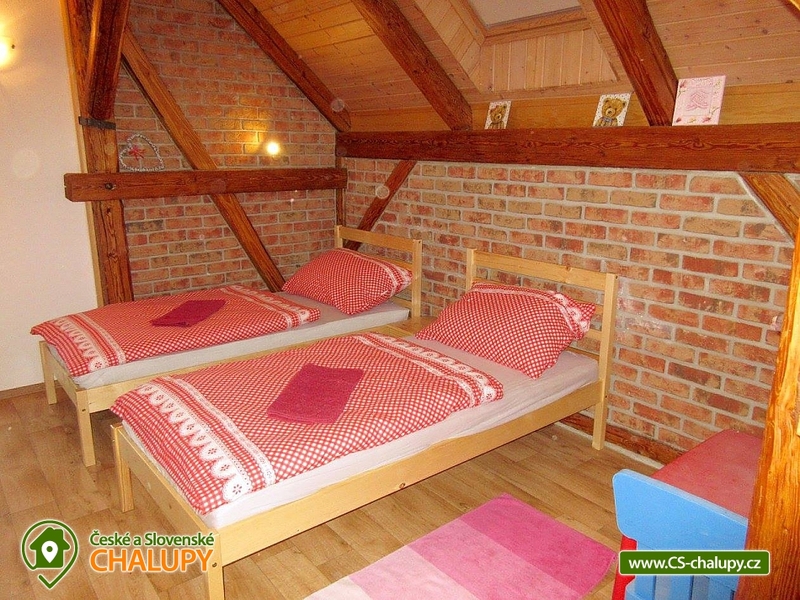 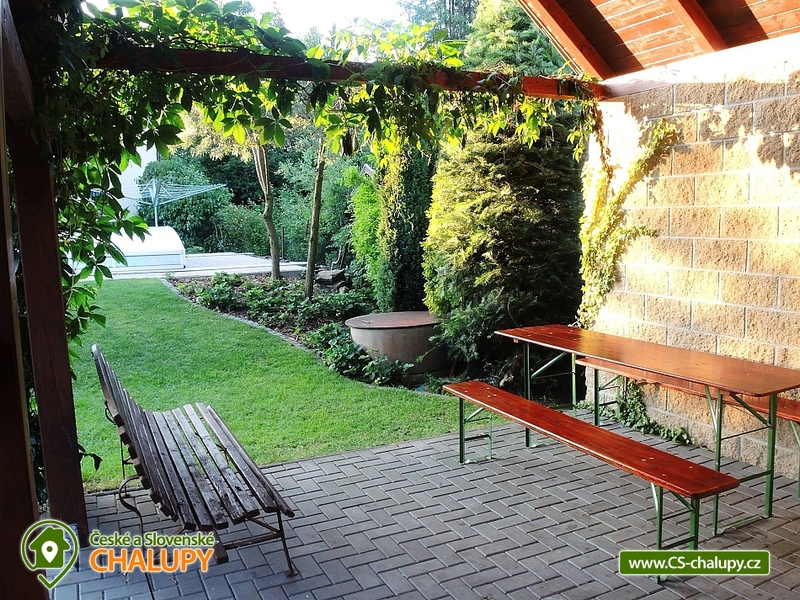 Chalupa u Vipa - accommodation Písečné (please contact us by e-mail here via the form). 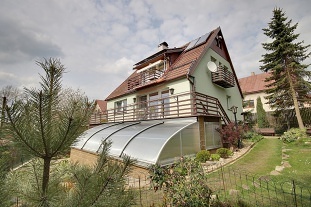 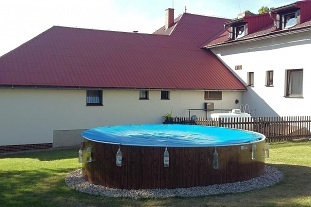 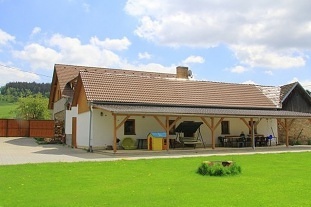 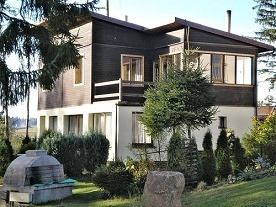 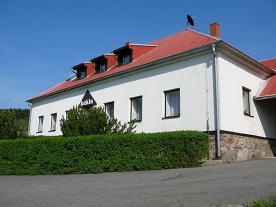 Rent cottages with outdoor swimming pool - Písečná, mikroregion Bystřice nad Pernštejnem, district Žďár nad Sázavou. 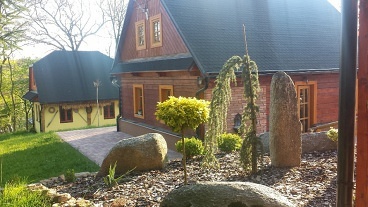 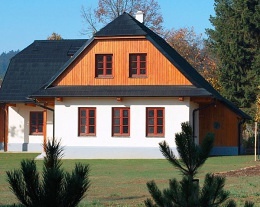 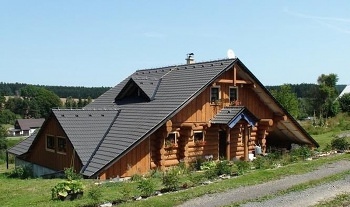 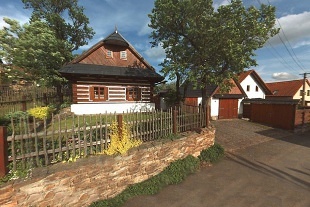 Rental cottage Vysocina. 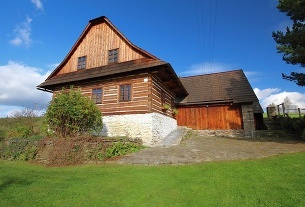 The cottage is rented only whole. Capacity 14 beds. 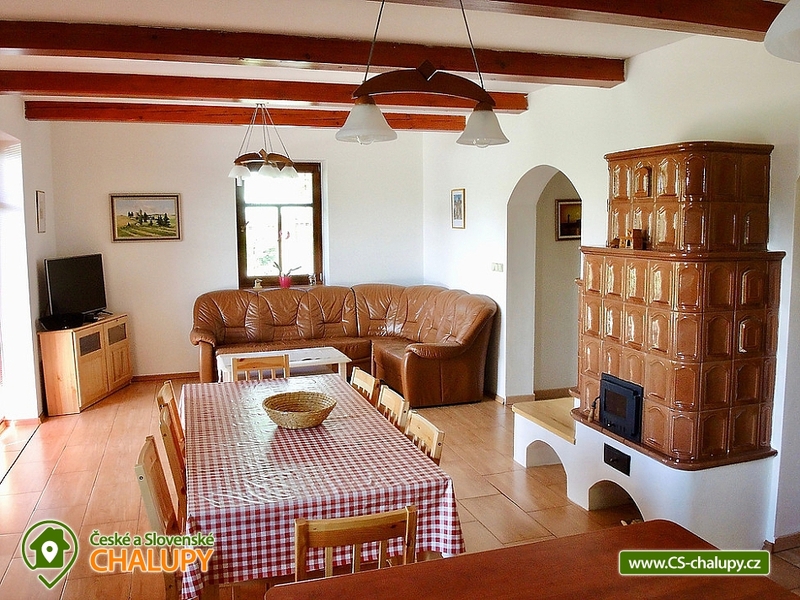 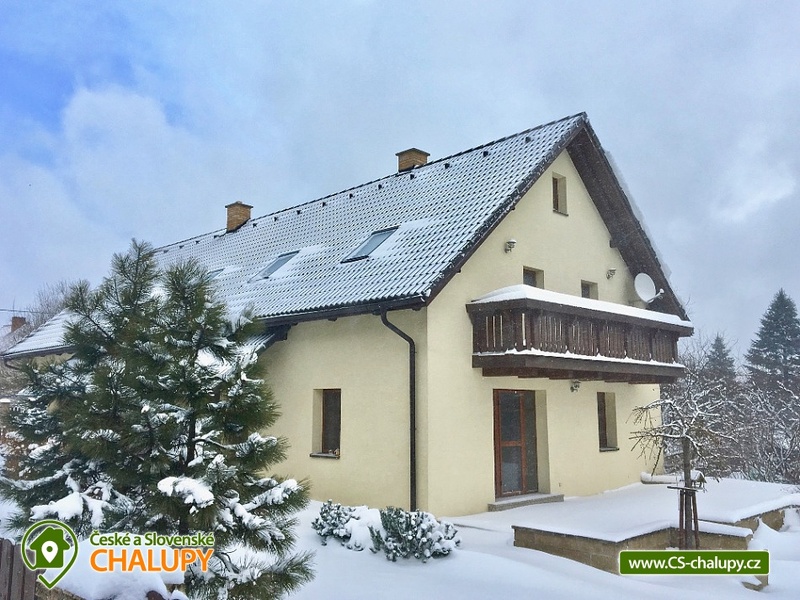 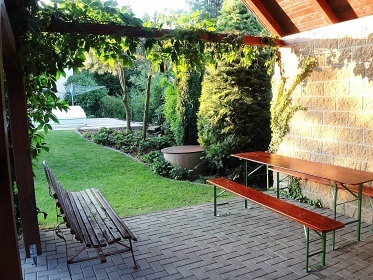 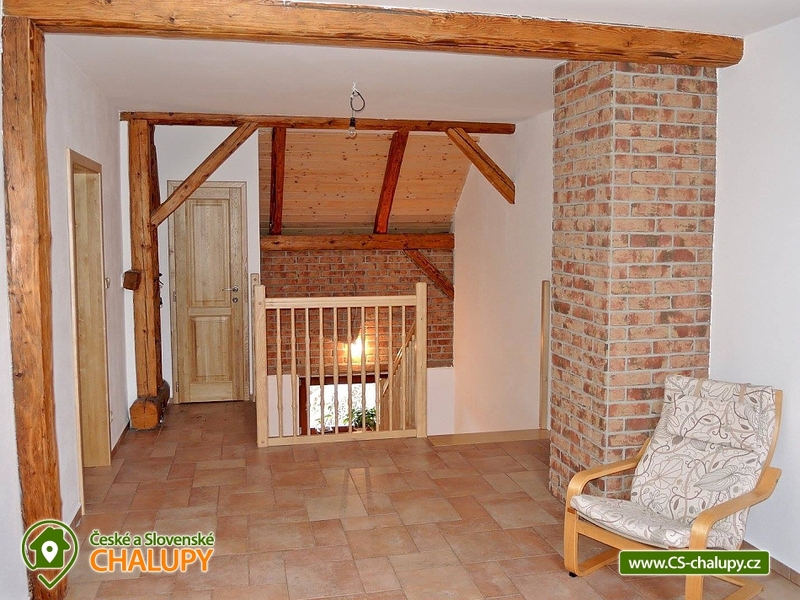 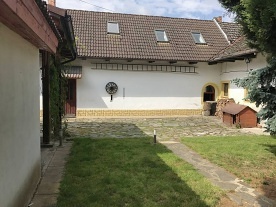 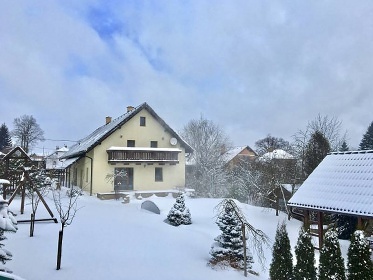 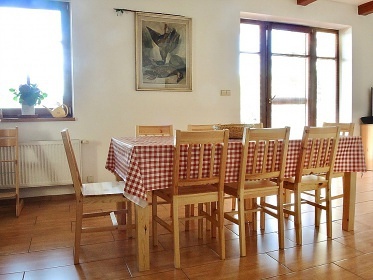 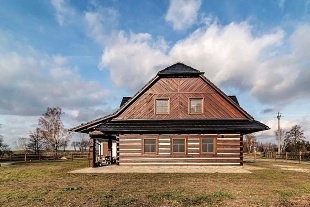 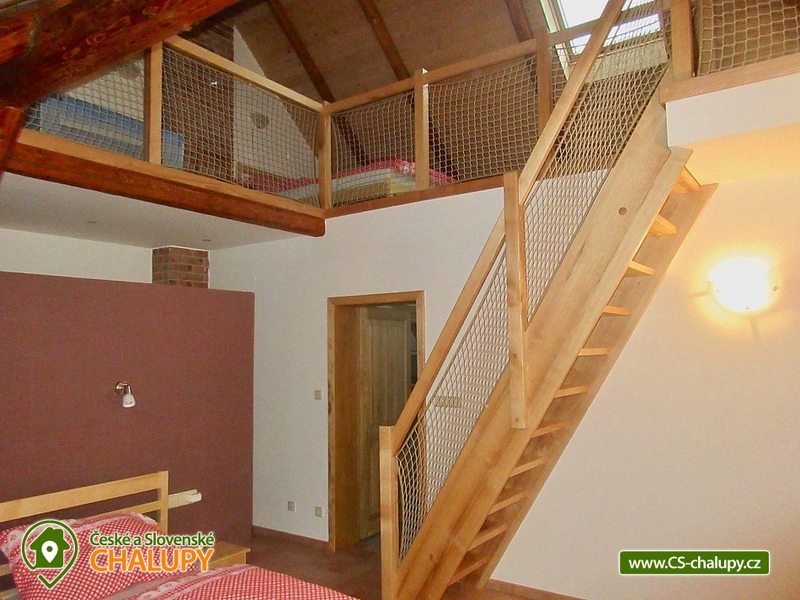 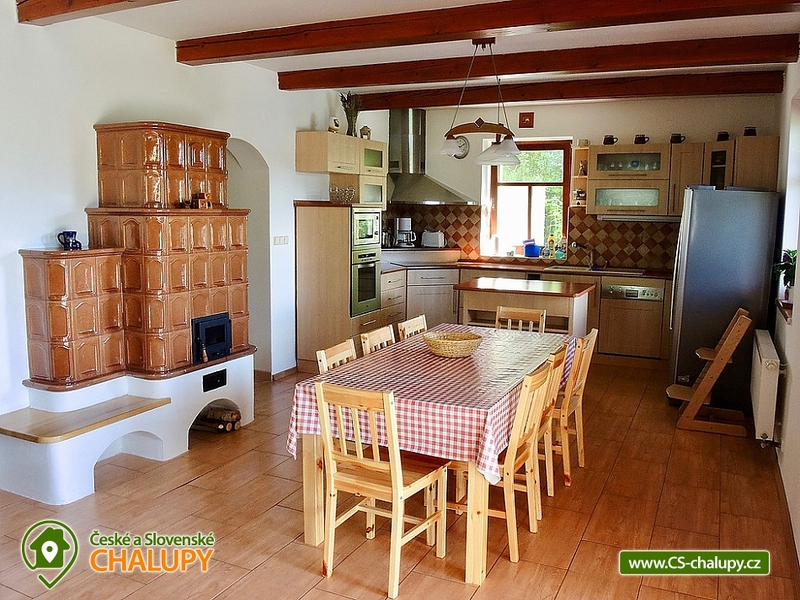 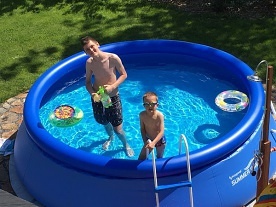 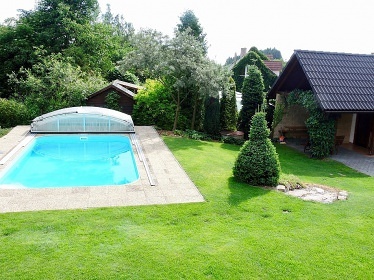 Rental of the whole cottage with extra equipment for your comfort - In the summer you can enjoy swimming in the covered swimming pool with the possibility of evening bathing (with lighting). 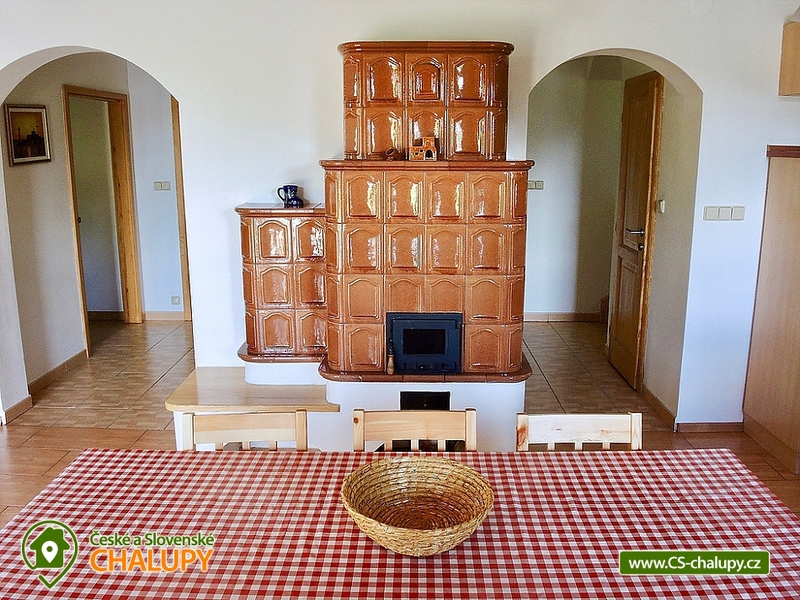 The cottage has a capacity of 14 beds, a fully equipped kitchen with a tiled stove, four bedrooms, a living room with a tiled fireplace, 2 bathrooms and 2 toilets. 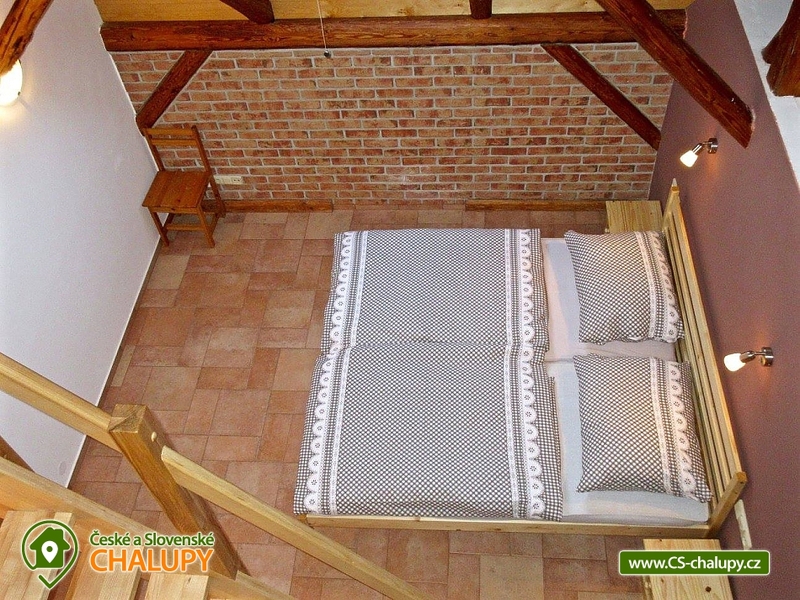 The size of the bedrooms and the spacing of the beds will give you comfort and privacy. Three large bedrooms on the floor will surprise you with their unconventional architectural design - they are two-storeyed. 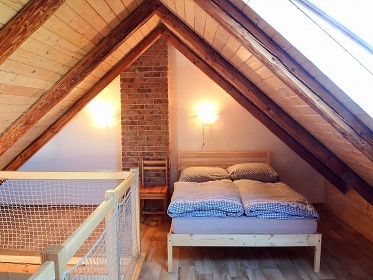 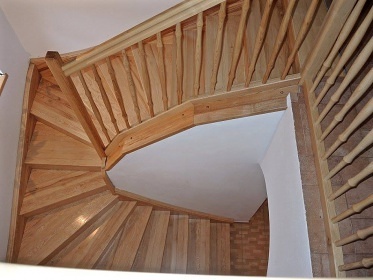 In each of these bedrooms, massive stairs lead you to the attic. 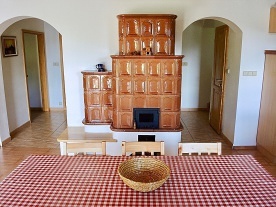 Sitting at the heated tiled stove will bring you a pleasant atmosphere of a country cottage like your grandmother. 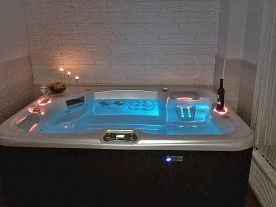 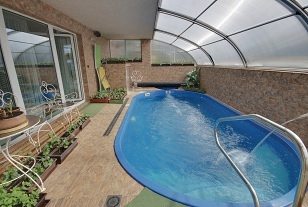 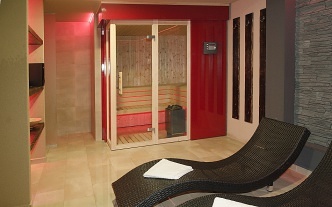 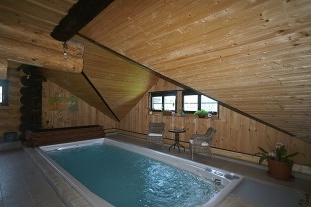 In the garden you can use the indoor pool, the jacuzzi in the bathroom. 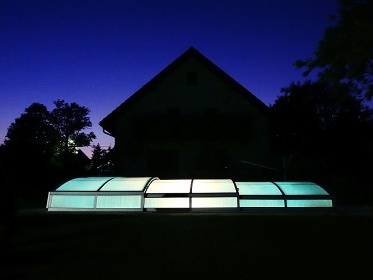 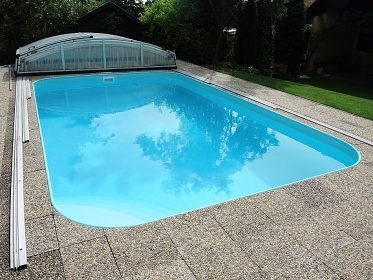 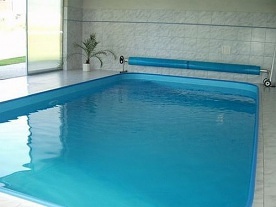 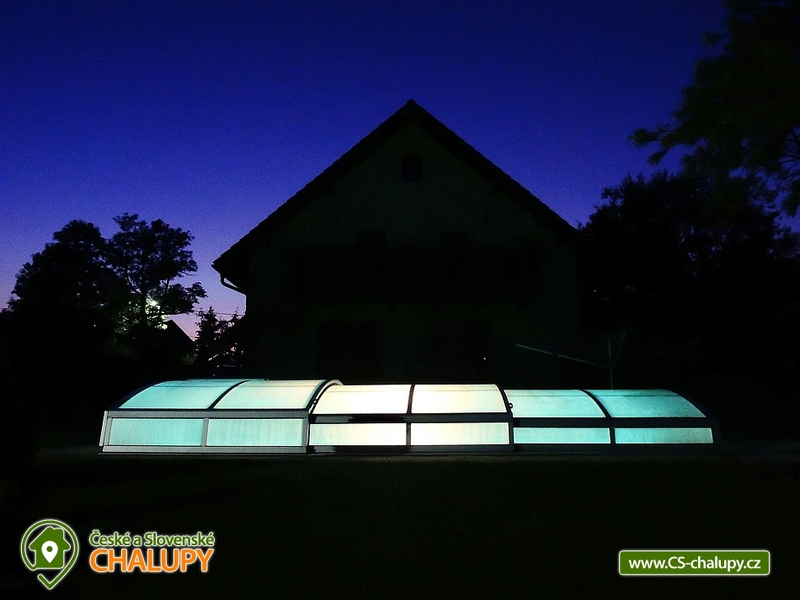 Swimming pool - size 3.5 x 7 meters, comfortable and safe steps in the water, sliding roof, night lighting. 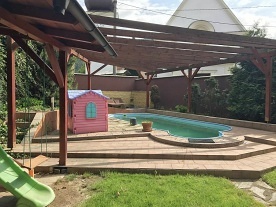 The whole plot is fenced. The cottage is newly completely renovated, with underfloor heating in all rooms and with parking in the garage. Bedrooms and rooms: Ground floor - Kitchen with dining table is connected to the living room, exit to the terrace. 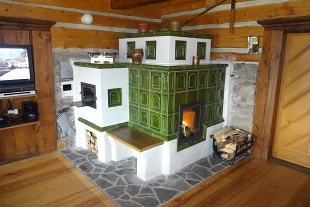 The room is dominated by a tiled stove. 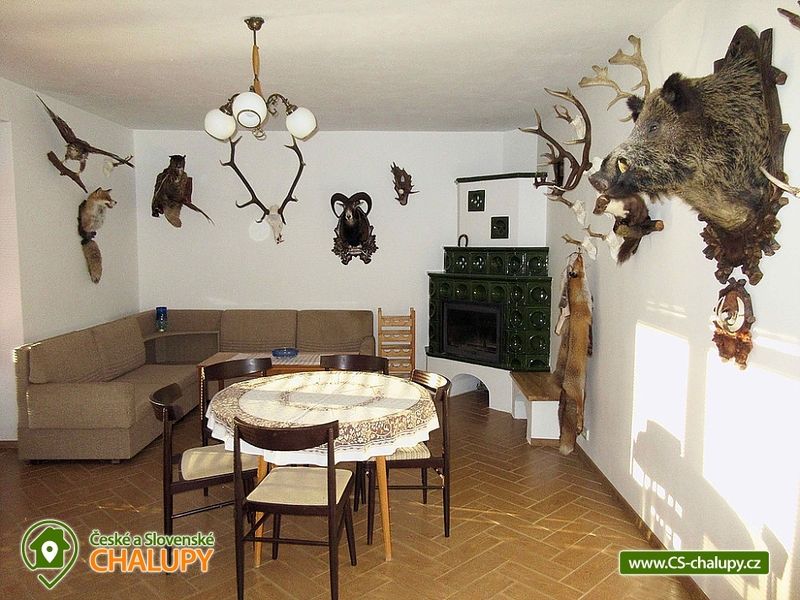 Lounge - lounge with tiled fireplace in hunting style with exposed game trophies. 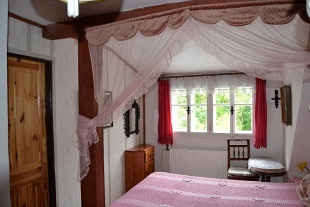 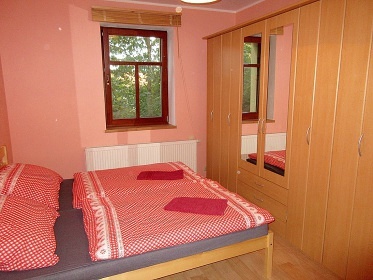 Bedroom - double bed (2 beds). 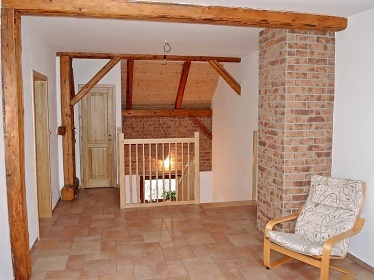 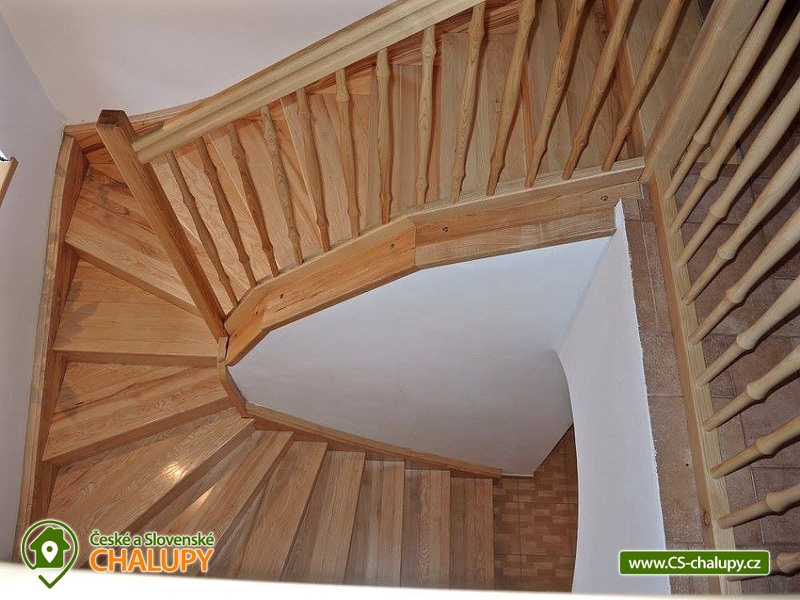 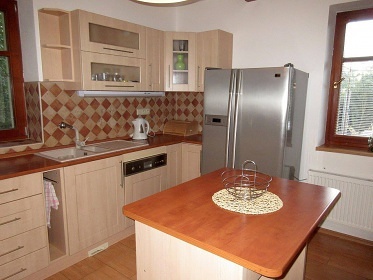 Floor - 3x duplex (double bedroom): Bedroom Marketa - double bed (2 beds) + double bed at the top. 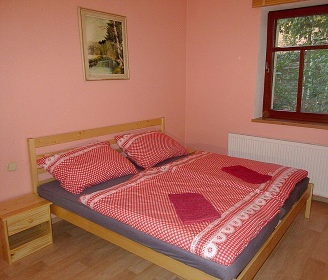 Bedroom Eliška - 4x single bed. 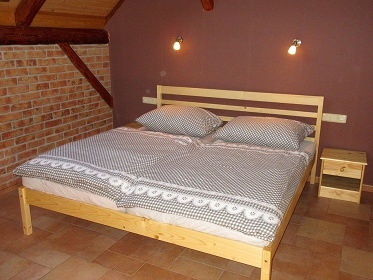 Bedroom Véna - 2x single bed + double bed at the top. 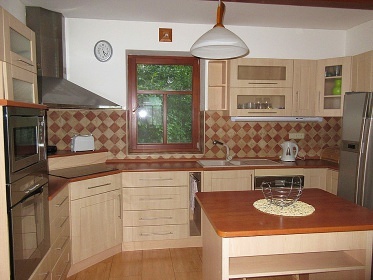 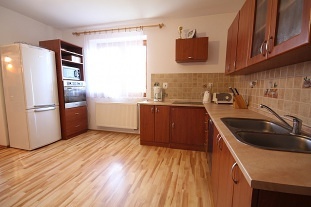 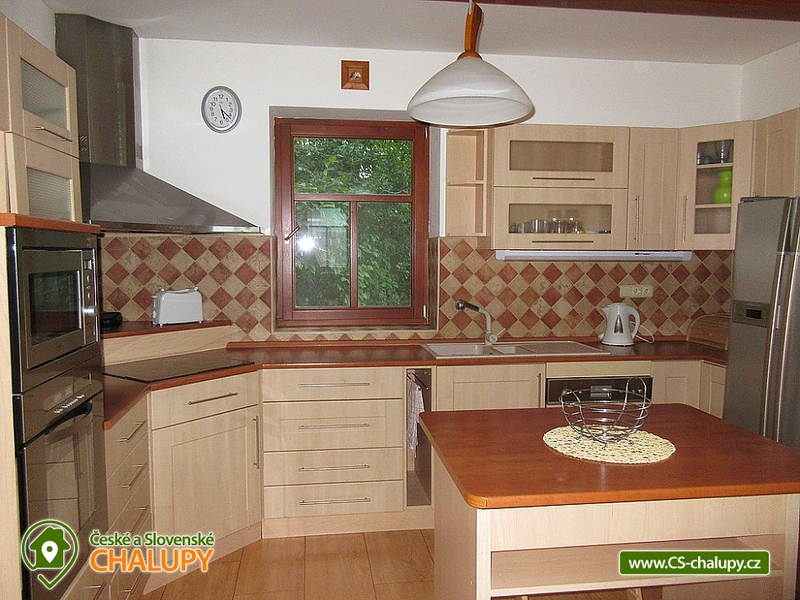 Kitchen: ceramic hob, oven, microwave, electric kettle, American refrigerator, dishwasher, toaster, coffee maker. 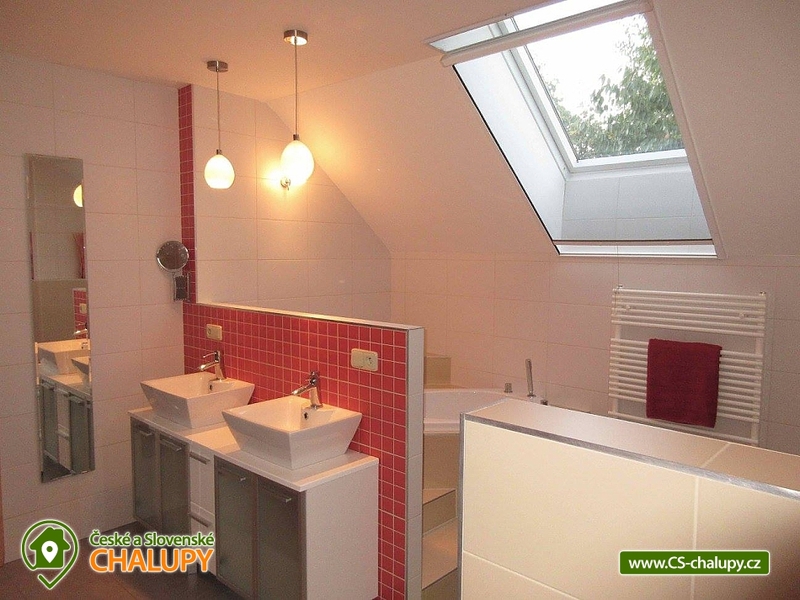 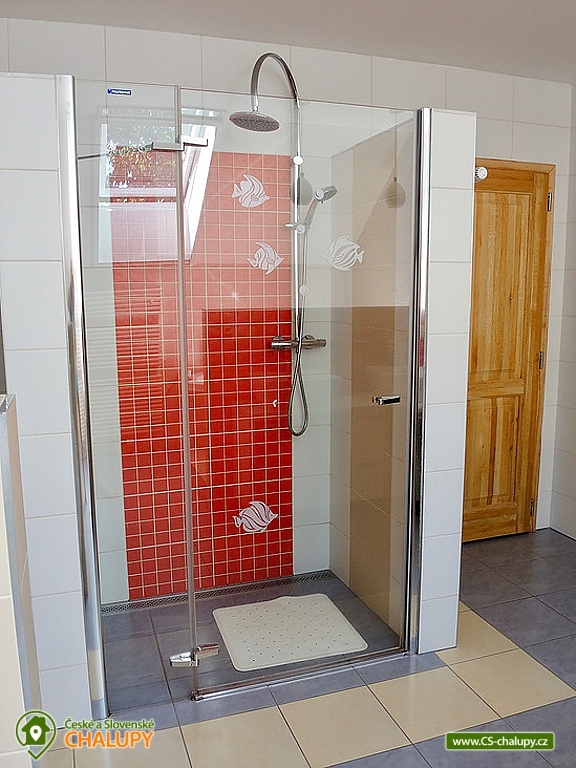 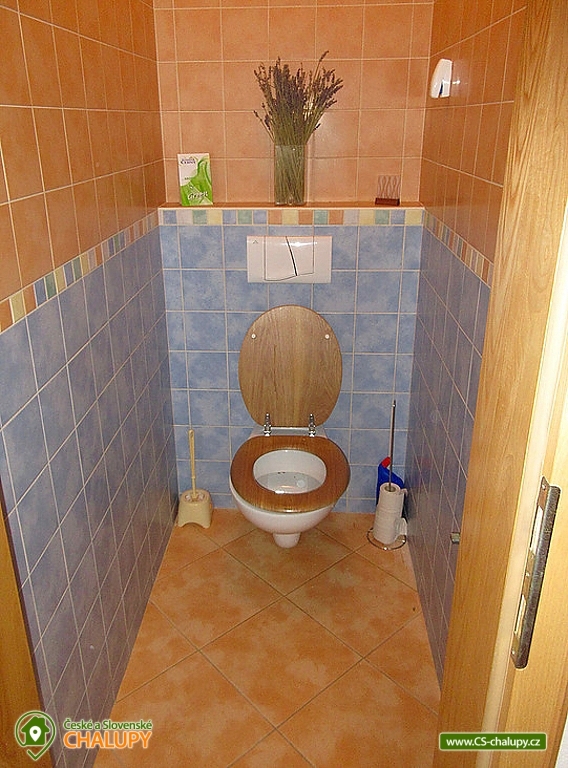 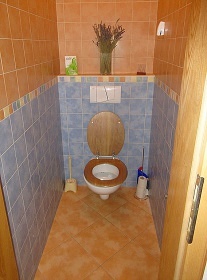 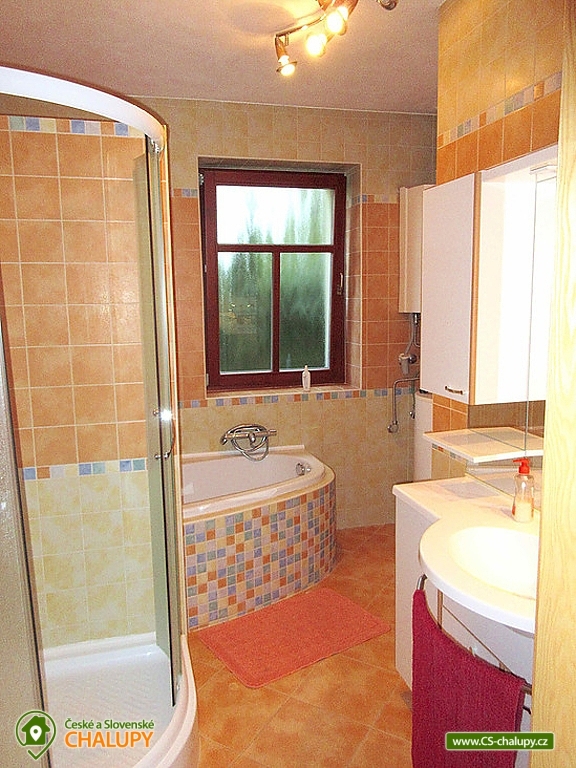 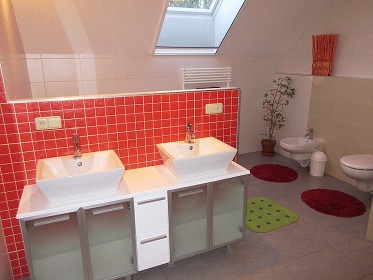 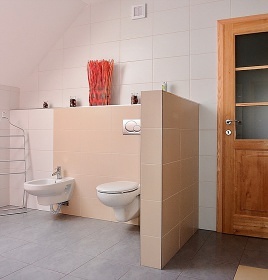 Sanitary facilities: Ground floor: Bathroom with bath and shower, separate toilet. 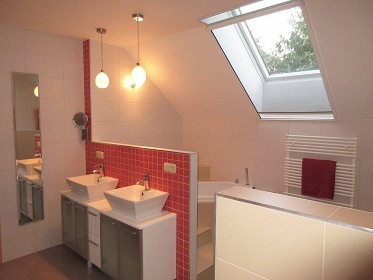 Floor: Bathroom with bath (whirlpool), WC + bidet, spacious shower, washing machine. Additional information Letní prázdniny - pouze celý týden (7 nocí). 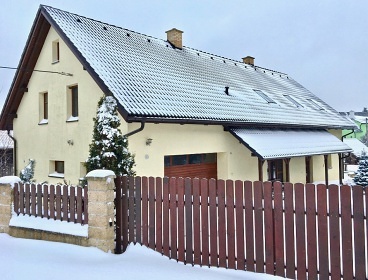 Vedlejší sezóna (září - červen): možné i víkendy, prodloužené víkendy. 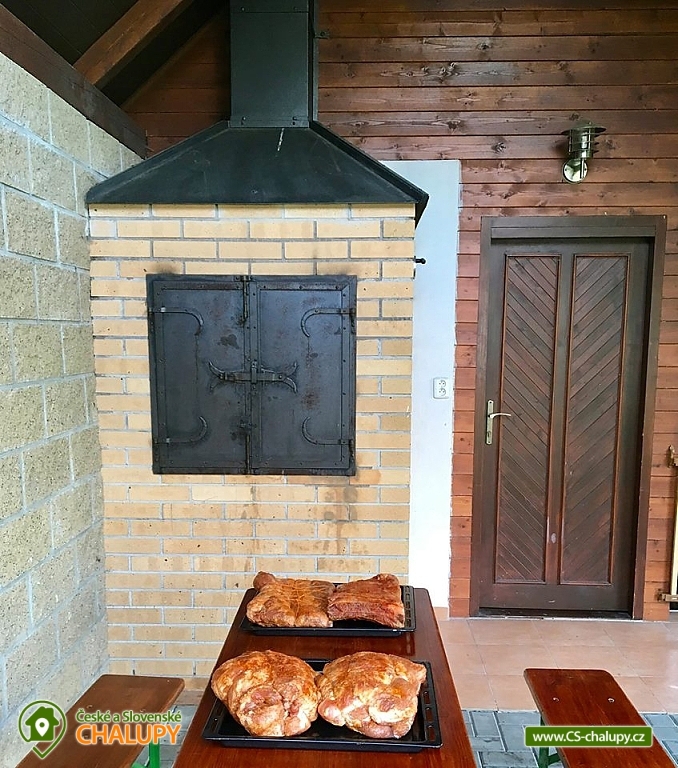 Cena dohodou dle velikosti skupiny a délky pobytu. 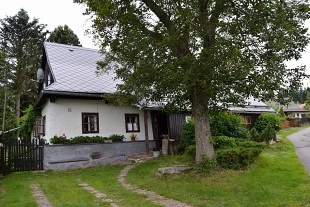 Additional information V případě závazné rezervace je záloha 5.000 Kč ihned, doplatek ceny nejpozději týden před příjezdem, platba pouze převodem na účet.